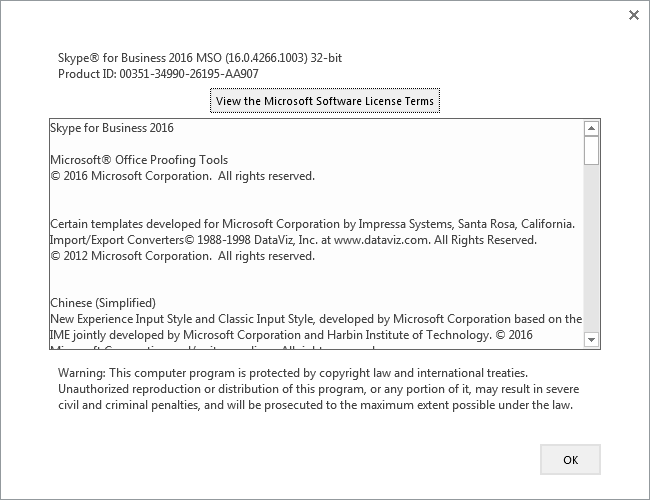 It’s barely out the gate and we already have an update for the Office 2016-based Skype for Business desktop client app, although this one just appears to be a catch-up, adding the fix for last month’s remote code execution risk into the new client. My client machine’s currently at 16.0.4266.1003, and this update purports to take it to 16.0.4288.1000, although as you’ll see in the Before/After section below, apparently “there are no products affected by this package installed on this system”. I’m running the full msi-based install of Office 2016, so I’m guessing this fixup might only apply to the click-to-run version. Ken Lasko and others have Tweeted of encountering some screen-sharing strangeness too. Wow: “There are no prerequisites to install this security update.” We don’t see that too often, huh? I’m running the msi-based install of Office 2016, so I’m guessing this fixup might only apply to the click-to-run version. 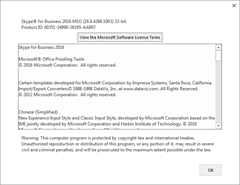 SfB 2016 MSO (16.0.4266.1003) ?? 6th October. This is the initial post.